BBC Radio 4 - Woman's Hour, Samplers exhibition. Harriet Harman MP. Director Susanne Bier. Doing Christmas well as a separated parent. An exhibition of samplers at the National Museum of Scotland and the children who stitched them. Harriet Harman. Christmas as a single parent. Award-winning director Susanne Bier. 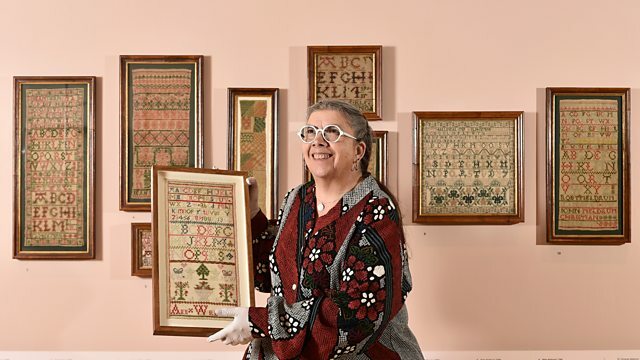 A new exhibition called Embroidered Stories has opened at the National Museum of Scotland featuring 74 samplers made in 18th and 19th century by girls and women whose careful work tells us about their education, families and much more . Jac Phillimore talks to the curator Helen Wyld, some of the visitors at the exhibition and to the American collector Leslie Durst who kindly lent the samplers she has been collecting for more than 20 years . If you’ve got children, how do you make the best of the festive period when you’re separated? Who goes where when and if you have them, how do you divide the family traditions? We hear from Zoe Desmond, found of Frolo an App for single parents, Sali Hughes a beauty journalist who separated from her husband a few years ago and Emma Gill, Director of Divorce and Family Law at Vardags in Manchester. Harriet Harman has asked the Attorney General to consider whether John Broadhurst has been given an unduly lenient sentence after admitting the manslaughter of his partner Natalie Connolly. She had suffered over 40 injuries - including visible blunt-force trauma and internal injuries. She died as a result of acute alcohol intoxication and from those injuries. On Tuesday this week he was sentenced to three years and eight months. Harriet Harman discusses her concerns about this case. And, she’s the first female director to win an Academy Award, Emmy and Golden Globe. Susanne Bier joins Jenni to discuss her new film, creating 3D female characters and Hollywood culture post the #MeToo movement.